In doing so the risks of getting tenants that trash their properties, and leave owing rent arrears, increases considerably. Not all tenants that are out of work or on benefits fall into this category by any means, but undoubtedly, for landlords operating in this sector, a contingency fund to cope with the additional risks and costs is vital. As the Private Rented Sector (PRS) expanded with the growth of buy-to-let, many new and unsuspecting landlords have come into the PRS, yet to learn the lesson of the importance of carefully selecting their tenants. This is especially important in the case of the causal landlord wanting to rent out their former home and expecting to return to it. Not all tenants are what you would expect, and it’s a hard lesson to learn for new landlords. Most experienced landlords learn that lesson early on and are prepared for it, but it always comes as a shock and leaves the owner feeling traumatised, as well as thousands of pounds out of pocket. In what for ounce is a welcome change to the landlord bashing articles peddled regularly in the media, this Daily Mail story shows the other side of the coin. 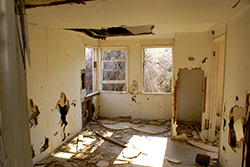 It’s a story, not uncommon in the lives of many landlords, to tell about tenants trashing a property before doing a runner, officially known as abandonment. Unsuspecting landlord Mr Reg Martin, popped round to his respectable semi-detached property in Stoke-on-Trent to do a regular inspection on the gas boiler. But what he found astonished him. To his amazement the house was virtually trashed and not really fit to live in. With the tenant nowhere to be seen, and with possessions gone, Ted could only assume the tenancy had been abandoned. But of course, given the law as it stands, he cannot enter to start the clean-up and repairs before he had established that the tenancy has in fact ended. Taking over an abandoned property in this way could result in a very heavy fine for Ted should the tenant return and clam he’s still a tenant. To be totally safe, Ted is faced with no alternative but to apply to the court; with courts overloaded, a lengthy process of obtaining a Possession Order before he can even consider starting the clean-up and repair. Ted was so disgusted by what had happened he up-loaded a video of the state of the property to YouTube. Although the lighting quality could be better, the video “Ball Green Wreck House” clearly shows the disgusting state left by these appalling tenants. The video which lasts for around three-and-a-half-minutes shows the extensive damage to the property, which landlord Ted found on his visit, with extensive rubbish, dog-chewed bones and and stinking mess scattered throughout the house. A Daily Mail article shows pictures of the inside of the property which the landlord had rented to a young couple in their 30s who lived at the house with a young child and a dogs. It’s a familiar story for many landlords and one that clearly shows landlording is not the cake-walk that many people think. Faced with this the landlord has no choice but to cough-up the money and repair the property if he is to rent it out again or sell-up. If he has a mortgage to pay he could be in danger of losing his property if he can’t keep up the payments. Landlords do need that reserve fund in cases like this. It is often futile pursuing tenants like this through the courts: they have no money so after spending hours building a case, paying the tracing, court and legal fees, and obtaining a County Court Judgement against his tenants, the landlord is hundreds of pounds worse off again, apart from the satisfaction of being in the right. “Sadly this is all too common. As agents we take up references, secure deposits and get rent in advance. We hold out for guarantors – although not everyone can get one. We even do social media checks on prospective tenants (and you wouldn’t believe some of the things that come up on this). This system works well for the majority of tenants.